In just one month in charge Ole Gunnar Solskjaer has restored Old Trafford’s belief in fourth place, returned the goalscoring success to a team that barely generated chances and managed to get names such as Paul Pogba and Marcus Rashford, among others, to accept the leadership who were asked for days ago. So many changes in just a month and, although now everything seems positive – full of victories with the Norwegian-, we review what did not work, what variations have occurred and what is missing from this new Manchester United. One month, seven games and seven victories. 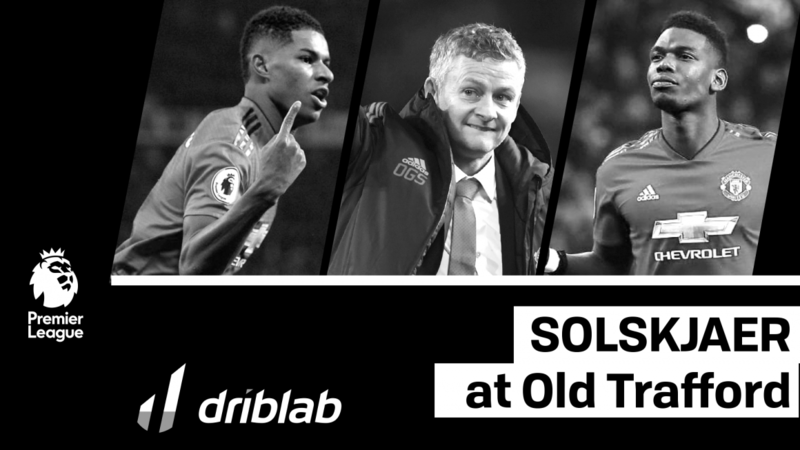 Ole Gunnar Solskjaer’s record continues without a hitch, partly because the calendar has helped with more friendly weeks, partly thanks to different approaches to what his predecessor Jose Mourinho was doing. A change that in one way or another has managed to Marcus Rashford step forward and Paul Pogba accepts be the main role of the red devils. The truth is that before comparing the statistics of the Mourinho era this season with the figures of Solskjaeer is necessary to talk about the level of theirs rivals: the ELO rating measures the difficulty of the teams, in the Premier League that metric marks that the average level is 1709 points. In the six Premier League’s matchdays with Solskjaer in charge the ELO rating of his opponents has been 1654 while in the last eight games of Jose Mourinho in charge of the red devils that coefficient of the rivals was 1756. In short, the comparison is marked by this circumstance, yet it is worth stopping to understand what has changed in Old Trafford. Beyond the difficulty of the rivals there are notable differences in approach. The first point is the possession of the ball that has increased by 7% although we could already see against Tottenham that is negotiable because in that game at Wembley Man United had less than 40%. The data that do speak of a change of style is the difference in terms of the verticality of Manchester United: that reduction in more than 50% is the reflection of a much slower team with the ball and wants to attack with passes to the foot and not running. Manchester United have a very fast attack but since Solskjaer arrived the main route to create danger is to bring together the men of attack in the final meters and not by counterattack. In addition, after being dispossessed is a team that prefers to start the pressure in the opponent’s half and does not seek to retreat, in fact in terms of pressure without ball the indices remain virtually unchanged but at other height. 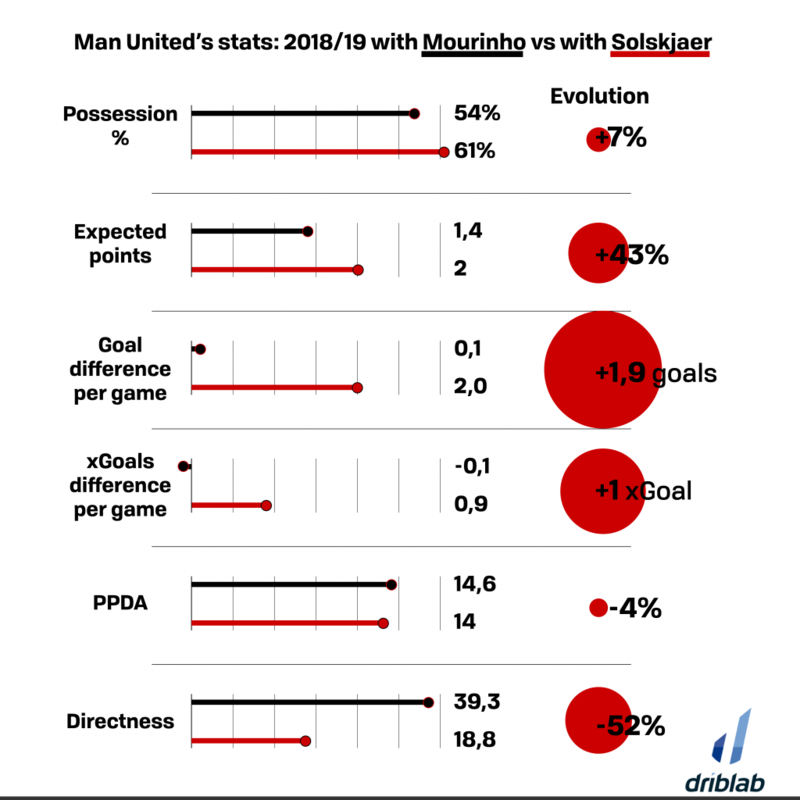 Changes that have allowed the team to perform better in terms of the number of expected goals created (1.7 with Mourinho to 2.2 with Solskjaer) and in the expected goals against (from 1.8 to 1.3). Although it was already demonstrated against Tottenham the need to continue improving (Spurs generated 2.5 expected goals) Man United is working better since it wants more possession and players closer to the area rival with and without ball. Much has been said about internal relations and rumours, what we do know with certainty is that there are players with a remarkable performance with Ole Gunnar Solskjaer who did not stand out like that with Jose Mourinho and we will try to find out why from each of the leaders of each line: Victor Lindelöf, Paul Pogba and Marcus Rashford. This season has confirmed Victor Lindelöf as Manchester United’s starting. 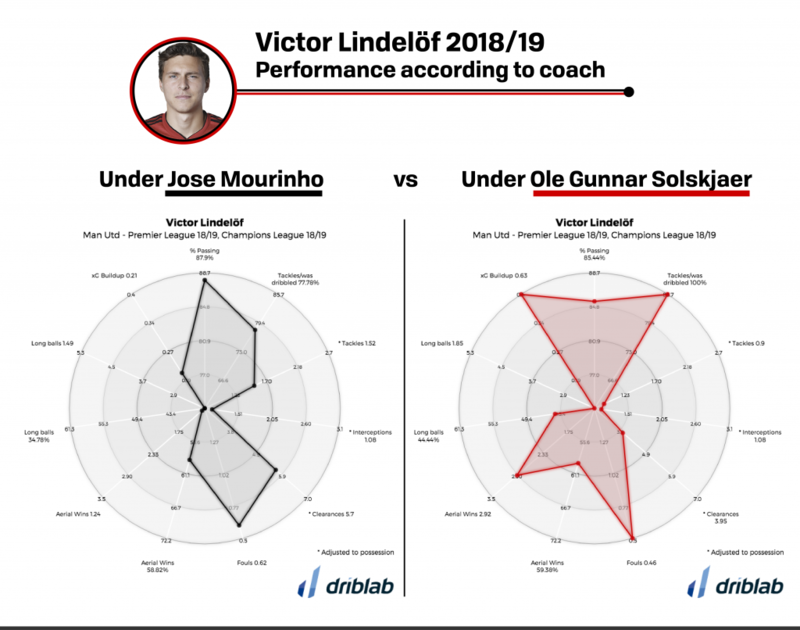 While the Swede already had the backing of Jose Mourinho above the rest of the defenders, now with Solskjaer the change of style is allowing us to see one of the best qualities of Lindelöf: the ball progression. Now that the team wants to attack more calmly and get the ball out being less direct we are finding the best version of the Nordic footballer since he came to Old Trafford a year and a half ago. 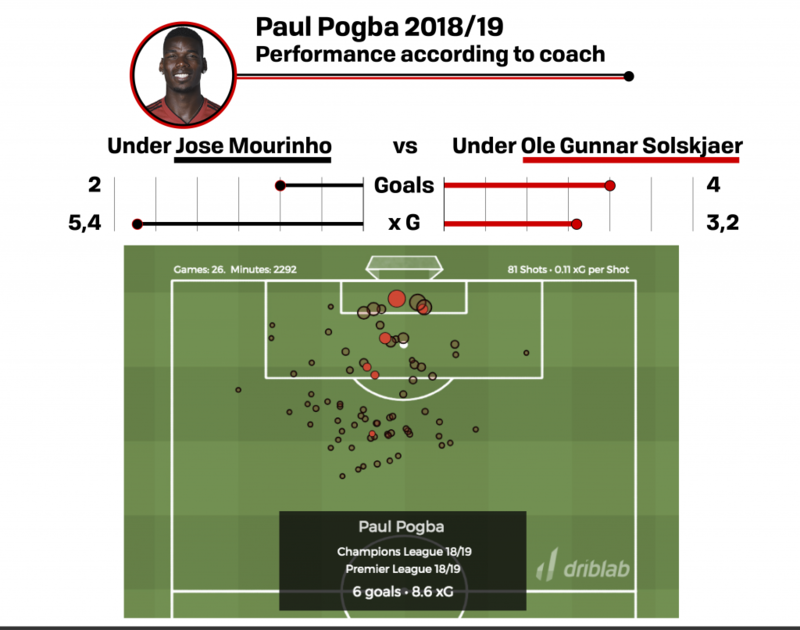 The season of the new world champion, Paul Pogba, was not being easy and since the change of coach his performance has improved in offensive and defensive production. The change is remarkable and easy to explain if we look at the area where he has had most influence with each coach. With Mourinho he was deeper, more focused on starting attacks with long passes, further away to the finishing zone and from the strikers to assist. Now, closer to the area thanks to Solskjaer opting more for Ander Herrer behind Pogba, the French is scoring more, giving more passes, generating more chances and more passes between the lines. In addition to a greater defensive contribution, that remarkable physical power is more effective pressing on rival half and being more aggressive to dislocate (has improved all its defensive numbers, especially in the success of the tackles with 20% more). In short, a great moment of form that is noticeable if we review their performance with goals/expected goals and assists/expected assists. 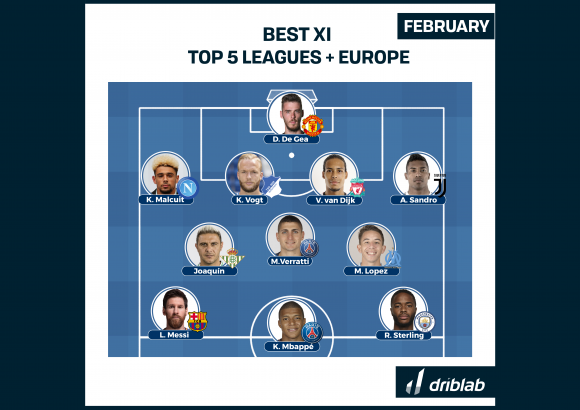 The good timing of the names we have pointed out is also very evident when we look at Marcus Rashford who is the top scorer since the Norwegian coach arrived at the club with five goals in six Premier League matches, more than he has scored up to now. 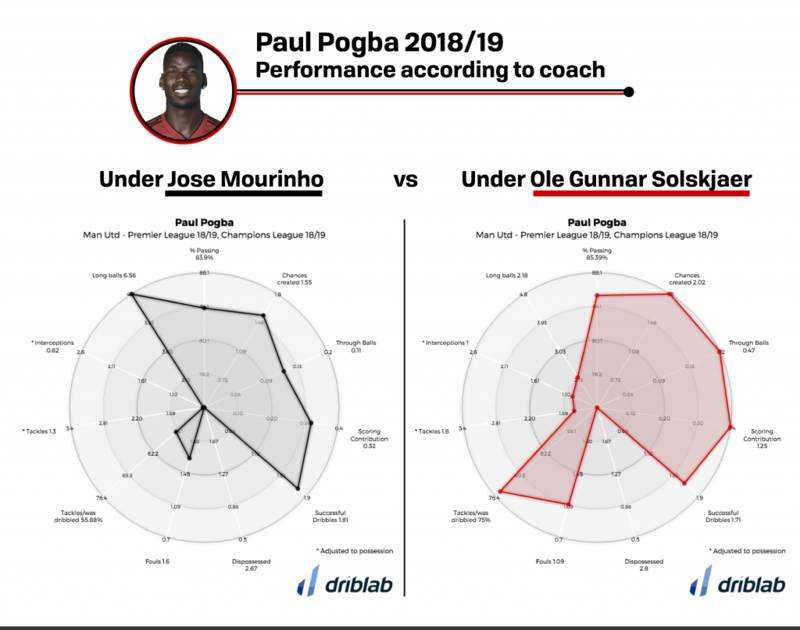 In this case, the change in performance is marked by the different functions that the new Manchester United coach asks him to perform: with Jose Mourinho, the young Englishman was a footballer closer to the wings with a main focus on assist rather than to finish. 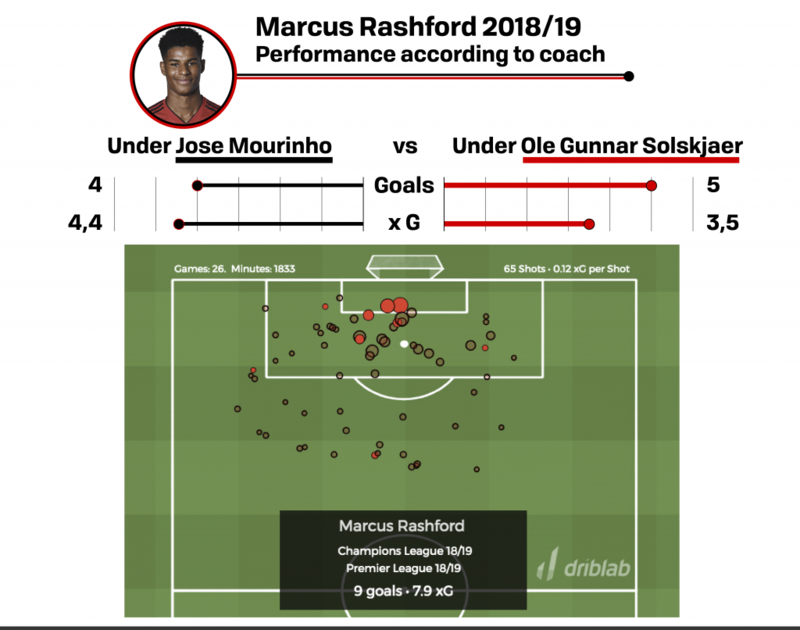 In the era of Ole Gunnar Solskjaer his work has changed: Marcus Rashford has to be the player who more shot, the attacker more related to the goal and with the box, his movements now are diagonals that look for shooting zones when before they were movement out to find the ball and give the last pass. Marcus Rashford is defining himself with a striker.